Summary: Bunny (Bernard) O’Toole is not David McLean’s smartest grandson, but when he receives a task like his six cousins after the death of his grandpa, he is the first to complete it without question. ‘It’ happens to be getting the tattoo his grandfather was never able to get, a souvenir from his time in the air force during the war. Getting his tattoo takes Bunny into a part of Toronto he has never visited, and when others recognize his tattoo as a gang symbol worn by a person with a kill. Suddenly Bunny has some new friends and respect he’s never known before, at least until he realises how in over his head he actually is. When the police get involved, Bunny must choose between saving himself and protecting the best friend he’s ever had. Review: Another incredible book in Seven the Series, Ink Me by Richard Scrimger is about Bunny, the grandson of David McLean who is faster with his hands than his thoughts. Written phonetically from Bunny’s perspective, it’s a unique read that challenged my reading skills. Who would have thought having a simple tattoo could be so complicated? Bunny’s grandfather seems to have intended for the tattoo to give him some confidence and teach him to trust by reassuring him that people have his back, but instead he is recognized as a member of the 15 street gang with a kill under his belt. This is ironic, because while the nickname Bunny is intended to note how quick he is, it also signifies his true nature. I loved that even though Bunny’s tattoo is what technically gets him into the gang, he has already proven himself when he rescues Jaden from a fight with a larger member of the Angels gang before getting it. Bunny demonstrates heart and a sense of justice with his first decisive action of the book. And he just becomes more endearing from there. I loved him as a character. Scrimger’s writing style helped me get right into Bunny’s experience and perspective, and the misunderstandings between Bunny and the gang were hilarious. But the best part was that I had no idea where Bunny’s story was going, and when I found out, I was so shocked I just sat stunned upon reaching the end of the book. 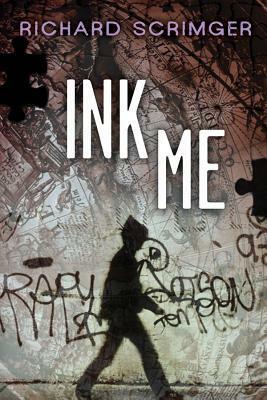 Ink Me is an excellent story that entertained me and made me think, with great characters and a plot that moves. While I had trouble reading phonetically at first, I quickly realised reading aloud in my head worked well as the words I did not visually recognise made sense when I listened to them. If the style is what is holding you up from reading it, then I recommend you listen to the audio version. I can’t imagine the work it must have taken Scrimger to write his book that way, and I think he deserves kudos for a stellar job. Ink Me by Richard Scrimger is published by Orca Book Publishers, (2012).